Tai Chi (also pronounced taiji) is a powerful series of interconnected flowing martial techniques which originated in China that have significant and long-lasting benefits for the body and mind. The essence of Tai Chi is relaxation through gentle bending, twisting, contracting and extending movements combined with deep diaphragmatic breathing to pump oxygen more efficiently around the body, leaving the practitioner feeling light, vibrant, and free from fatigue. With practice, the adept will have excellent coordination, a dramatically improved posture, greater sense of balance, and a heightened sense of vitality without exhaustion. In addition, the body becomes stronger and more immune to disease. Legs become powerful; backs heal and take tremendous strains easily; upper back tension drops away, with “humps” vanishing; the breathing deepens and is lead by the diaphragm;organs become stronger through better nutrition as a result of deep movement; lymph is pumped more efficiently. See the Benefits page for more. The origins of tai chi are lost in the mists of history and still generate controversy, but its essence remains one of relaxing into your body and mind, something which is of pressing importance in these technologically stressed times, where 2 seconds delay in front of a green light is “a long time”. Relaxing the mind is difficult. Stress is killing people; whether through work or family problems, it’s on the rise. Our society is obsessed with externality, surface and distraction. I can offer you interiority, depth and awareness. People are dying younger and younger from preventable diseases. Tai Chi, and its attendant Taoist technologies, offer a real chance for people to plug into themselves and find a level of calm where the feverish pace of everyday life can be stilled. There’s no religion or mantra chanting involved, just a rearrangement of your body into postures and alignments combined with a correct level of mental awareness that aid the body in healing itself, for the body wants to heal itself all the time, if you just allow it space to do so, and stop the self-sabotage which so often blights our day. Tai Chi allows you to go inside to your interior landscape, to learn about your internal topography so that you can feel something happening long before it goes badly wrong and potentially turns into an illness. We have become so dependent on doctors that we have abdicated responsibility for our own health, resigning ourselves to pills or palliative medicine. You can take control of your health and not get sick. Tai Chi can help you on that path. It must be done with a change of diet or there will be little real long lasting benefit. The slower you get, the more you listen to your body and so the more you will eat and drink better for it. There is no rush. Most stress is self-induced. You choose to be stressed. The mind has a choice to initiate the emergency response or not. What your mind thinks, your body believes is happening. When you have a nightmare,you wake up sweating, heart pounding. How can your body react this way? Because your body has no eyes. Your body relies on your mind’s eye to see the world. If your mind’s eye sees a threat in a computer file being lost, your body will react as if a sabretooth tiger has walked into the cave. It’s that reliant on your interpretation of reality. Your health is in your mind. Your body is in your mind. You must listen to your body, get to know it, and make friends with it. It is all you really have. 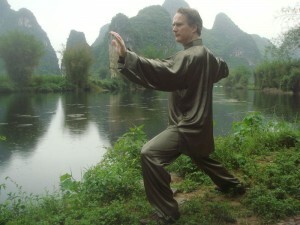 I think tai chi and qi gong are the most sophisticated movement arts on the planet. When you compare them with the competitive sports which abound in the world, it may not be so exciting, but you won’t damage your joints, get injured or have to retire at 35. Even among martial arts, proper, traditional tai chi is better for you than many of the hard style martial arts that predominate in the media. I have many students who did karate for decades until their knees or elbows gave out. Tai chi and its counterpart, qi gong, offer longer life, deep relaxation and health until old age. IF you eat proper food and drink clean water and get enough sleep. These things are all important for a healthy life. You are here: home >> The Disciplines: Internal Martial Arts >> What is Tai Chi?